Successfully Added Compact Tactical Red Laser Gun Sight (Dual Weaver Rail Mount / Under Mount) to your Shopping Cart. 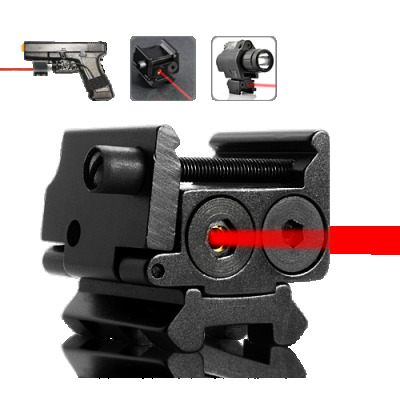 Introducing a professional precision red laser gun sight with a convenient dual weaver rail for multi-mount use. Light weight, compact and highly functional, look no further for tactical gun sight. This high quality professional laser sight enables you to aim more precisely with your weapon of choice. It’s lightweight and compact and is easy to attach, it uses very little power and comes with 3 AG5 batteries. It’s perfect if you want to switch between targets quickly and fire rapidly at moving targets. It features a dual weaver rail (under mount) to attach extras, like a flashlight. This laser sight is the perfect solution for people wanting an affordable solution to their weaponry accuracy needs. The convenient weaver rail on this precision laser sight means that you can mount this laser on pretty much anything you want, pistols, shotguns, rifles, machine guns, interstellar doom rays. It’s perfect for Hunting, Spotting, Search and Rescue, Outdoors, Hiking, Assassination and thrilling scenes where you aim your laser at someone and they look at it and wonder what it is before you blow them away. With this awesome laser, your average accuracy rate will skyrocket, probably to 99.99% reoccurring, and your weapons will look that much cooler. Some people look down on lasers, saying it makes things too easy, but when it comes to a gunfight, I’d rather be the guy with the laser on his gun, not wasting bullets, than the guy who’s hiding behind cover having blasted all his ammo away uselessly. Most importantly this laser sight is on offer for an amazing deal, which you won’t get anywhere else. Order this awesome Laser sight today for a great deal, it’s the perfect accessory for any type of gun and it will improve your accuracy and enjoyment in shooting. We provide a 12 month guarantee on products and if you “Add to cart” now and order today, we’ll ship it out tomorrow. This great laser sight is brought to you buy your source for awesome electronic goods, Chinavasion.